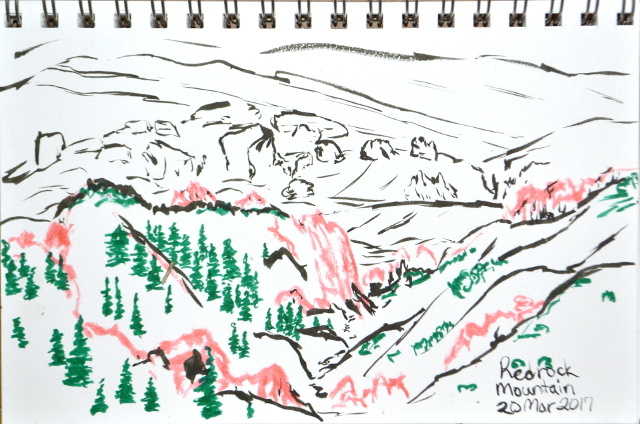 Waterfalls and mountain peaks and all the flowers along the way seem to have characterized this month. 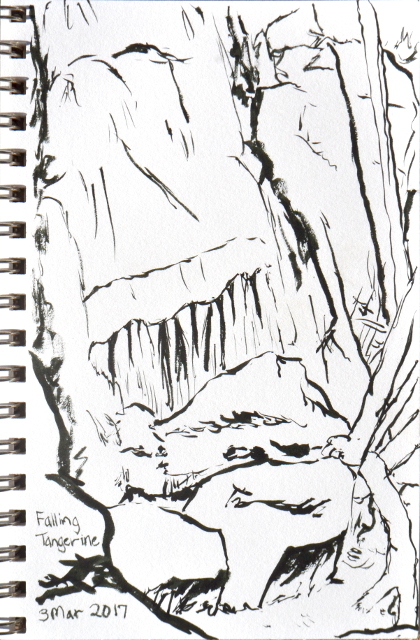 The long time dry Tangerine Falls has a nice sheet of water. 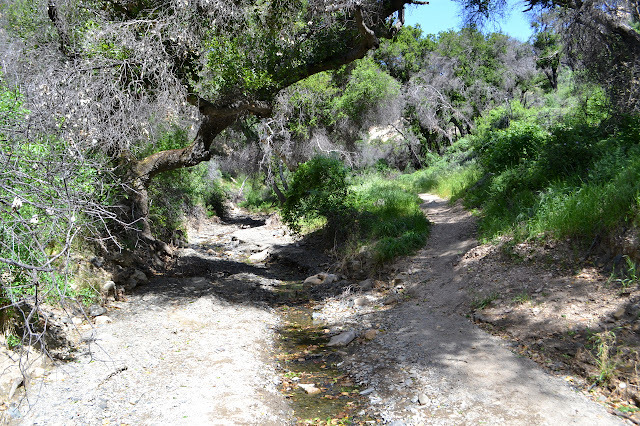 Also long dry, I went to see the Ventura River. The pond past the preserve has been moist, though. Celebrating the colors of the mountain at the top. And celebrating more water from the top of Sage Hill. Our forest is gaining fees for practically everything. Picnicking and trailhead parking are going to be $10 a day once all the infrastructure is in. Aliso Canyon will be one of these fee areas, but does not quite appear to be yet, although the Sage Hill Group Campground fee station makes no effort to point out the difference between it and the trailhead parking. (And, considering it designed for large groups, the posted fee schedule for "single" and "double" sites makes little sense.) Somehow I am at least four times as annoyed at the idea of paying $10 to a private company to use these public lands as I am to pay $5, with the option of a pretty cheap yearly pass, to the actual stewards of these public lands. (There are some hints about an annual pass, but at least a few of the avenues to obtain it are dead ends.) As such, I already have a plan for free parking in a lovely and very large turnout on the side of the main road that includes a little bit of the trail beside the river. Since there actually is a river to take in today, that is where I parked. Sage Hill from the Santa Ynez River flood plain. The remains of the bridge seem a little substantial for the "footbridge" marked on the map. There is a bit of old road below the turnout, but this does not go far before dissolving into vegetation choked area with a cliff below. Walking down the road a short way is a much better way down, then cut across the day use area to the river. Exploring along the side, there are no rock hopping opportunities. It really is quite wide at the moment. I just pull off my shoes for the crossing. There are a few deep channels to avoid, but otherwise it is only up to my knees and not particularly swift. 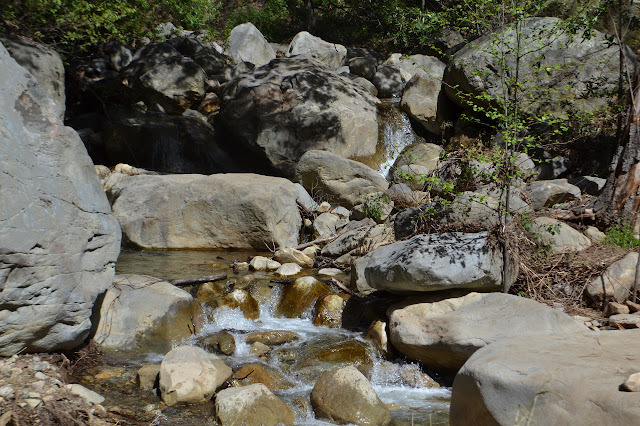 The rocks are sharp under my bare feet in a very slow moving section that is more like a shallow pool than river. Tadpoles even line the side of the slow water. 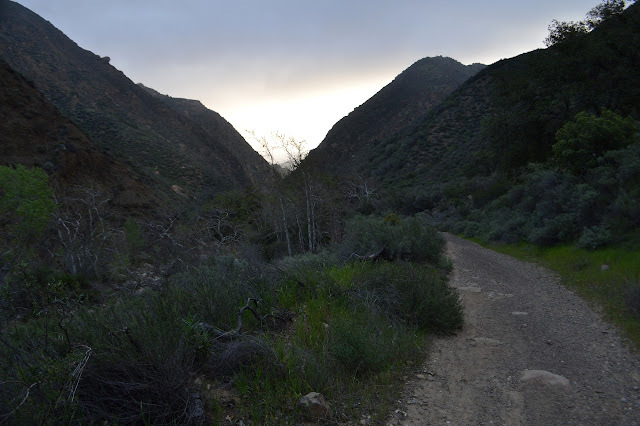 The river trail on the far side is easy to find and follow around to the trailhead in the canyon. Sage Hill, the main target for today. A few spots of orange for poppies and yellow for invasive mustard. My objective for today is to climb Sage Hill and I wanted to get to it while the flowers are plentiful, especially poppies. Clearly it is just a matter of picking a slope and walking up. Some slopes are better than others. First, though, I head for the canyon. 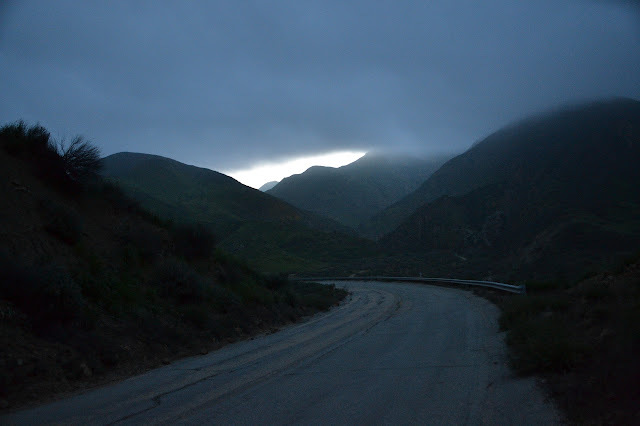 Starting up Aliso Canyon late in the morning for lots of light. There is a little water here still. A small patch of California poppies in the canyon. These are the flowers that might be finishing up in a few weeks. Redrock Mountain really catches the eye when viewed from the west side where its deep red heart is on display. Since I have plodded along on a few trails that do this, the mountain has eaten into my consciousness. The area around it was once quite popular among hikers and each excursion I have done around its base has shown me new reasons why. 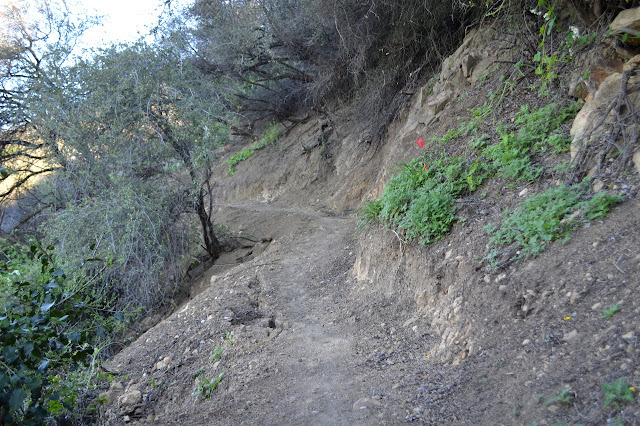 Today, any entry into the area requires first a mile along paved roadway before getting to a trail that can get one to the good stuff. It tends to weed out anyone who is not looking for a long hike. Today, I am looking for a long hike. 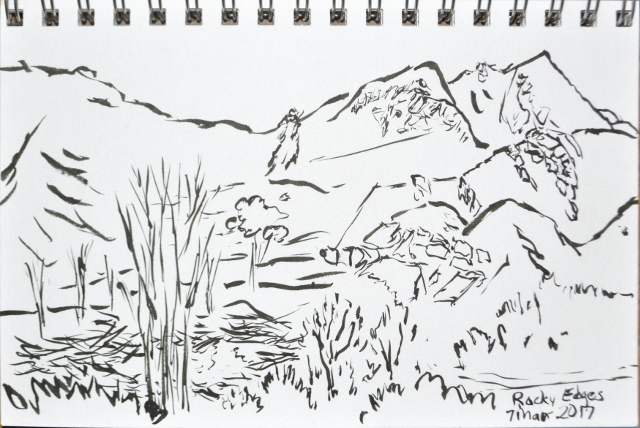 I will head up Fish Canyon and climb that mountain, then return via Redrock Canyon and (Old) Telephone Road. A previous excursion that returned via Telephone Road lead to a bit of disappointment in being only able to see some of the beauty around me because it was already getting dark. Timing for off trail travel is uncertain, so I could end up in the same situation today. An early start would guard against that and that is why I am starting down the paved road as the sky thinks about brightening. Not much of a color show as the dawn breaks. There is light. There is a glow from the power plant and from the many cars of people arriving to work at it. Very low clouds do not promise much of a dawn show. As I walk, there seems to be another glow developing deep within Fish Canyon that slowly swamps all else. Light reflects from the creek. 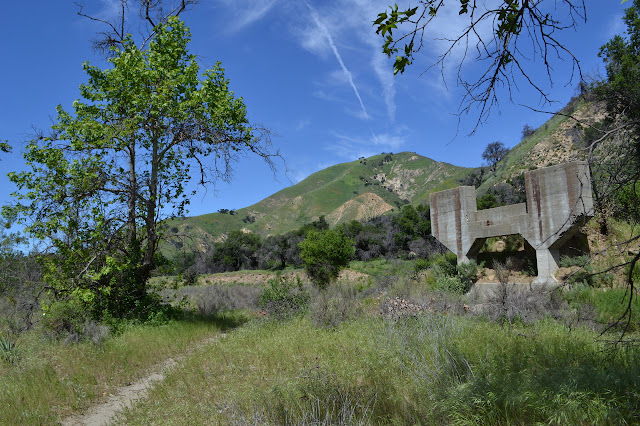 I can hear Castaic Creek below me but cannot see water in it until the bridge. What is running through the gauge does not seem very substantial, but it is much more than I have seen before. It must be about sunrise by the time I start up Fish Canyon, but there is little clue of it from the sky. Things just sort of get brighter more and more slowly. Fish Canyon seems to have a nice flow through it, but not nearly so much as the willows appear to have withstood recently. 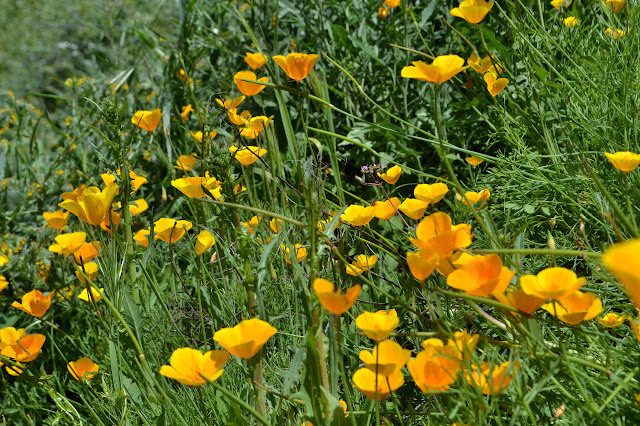 Some of the hillsides are golden with poppies. The color will be even brighter once the flowers actually open up for the day. Entering the canyon. The sycamores have only started to leaf out. 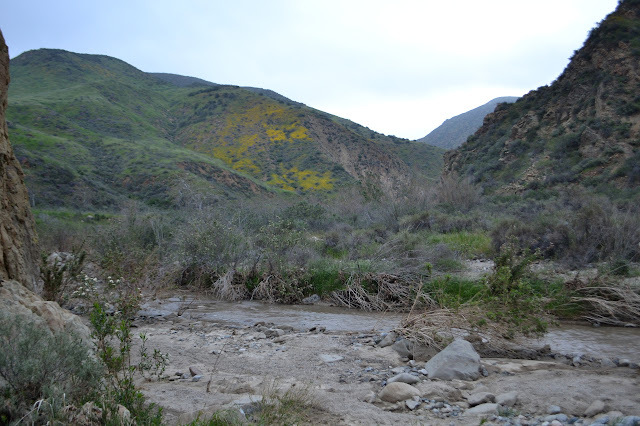 The super bloom going on around Borrego Springs and in Anza-Borrego Desert State Park is expected to reach its peak in the middle of March, so the Hundred Peaks Section planned a rare outing without any peaks to climb for the ides. Looking at just the cost of gas, the price of admission does seem staggering for a single day looking about. Still, this is supposed to be a 1 in 20 years level event, so I decided to get up in the early dark and get myself down there to see this bloom. First stop along Henderson under Coyote Peak. Our first stop is along Henderson Road, but we have been seeing flowers for a while at this point. At first glance, there are only about three types of flowers in the field. Most noticeable are masses of yellow of desert sunflower. 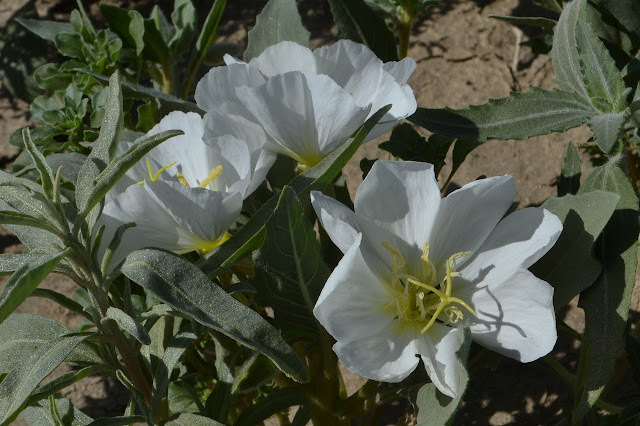 Big floppy white flowers of the dune evening primrose are quick to catch the eye. Big puffs of purple of desert sand verbena complete the initial colorful impression. Dune evening primrose in the sun. 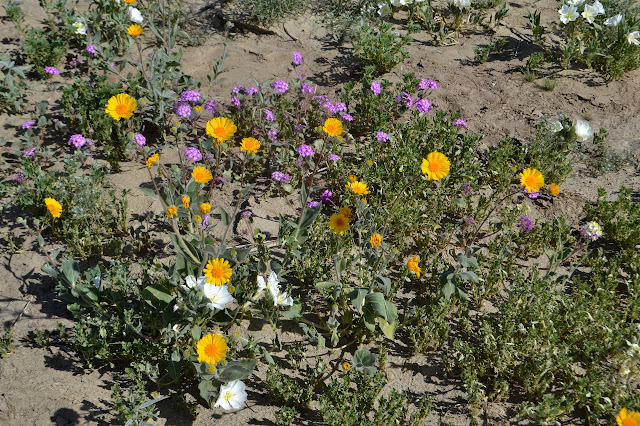 Sunflowers standing over desert primrose and desert sand verbena. There are quite a few green stems that are not yet flowering, too. I have gotten on various mailing lists for trail work volunteers and today it means hitting "phase III" of the Franklin Trail without having to walk up to or along the various utility roads first. Our entry point was surprising to me, but the final parking is exactly as expected. With a safety briefing, we take off in two groups to do some trail work. I am with Mike who is cutting away the brush to bring the trail up to specifications for hikers, mountain bikers, and equestrian users. The last requires quite a bit of clearance. We head up a little over a mile to where we are starting work. The trail looks a lot different from when I was here before. There has been a lot of tread work on the trail now. When it was just a "p-line", it was just clear enough to let the odd archaeologist or biologist through. 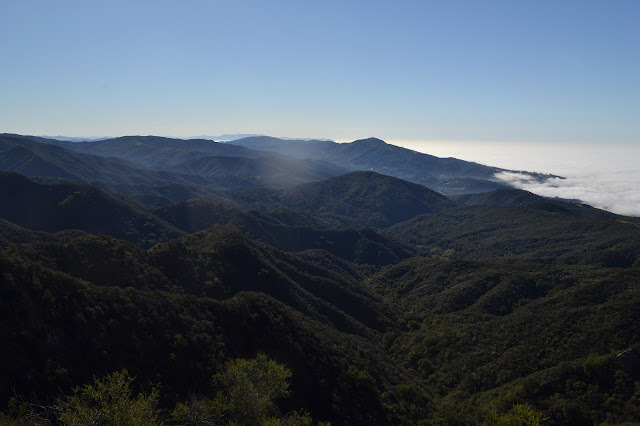 There is very little city below because the ocean is topped with a sea of fog. 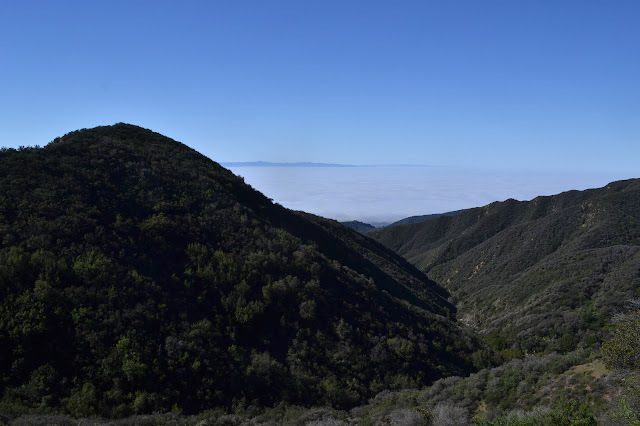 Down the valley to Carpinteria and Santa Cruz and Santa Rosa Islands. 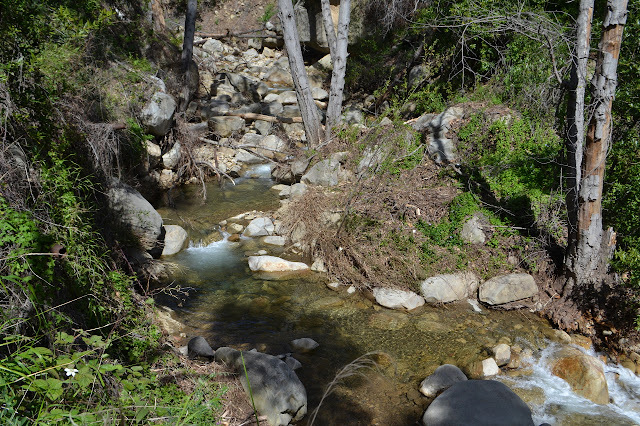 I headed off to the Riverview Trailhead of the Ventura River Preserve to see the Ventura River. It is, as far as I am concerned, a mythical thing. There is certainly a space for it to fill and the water wells within the preserve hint at some underground flow, but it has always been parched white rocks when I was there. Not even puddles in some deep pools. 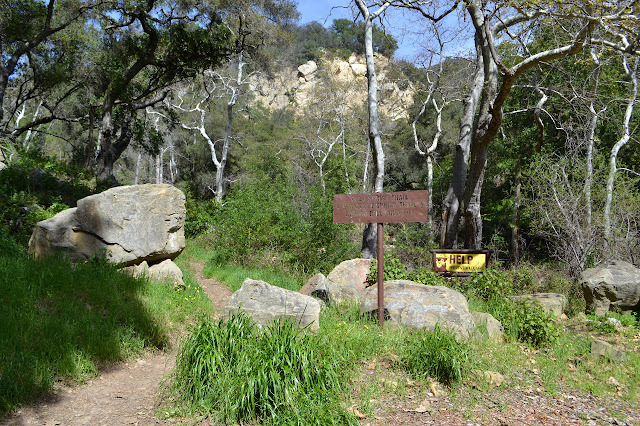 I will then have to cross it to have a nice hike through the preserve, so I tried to figure out what that would mean. I found an online gauge for the river that indicated about 44 cubic feet per minute going past. 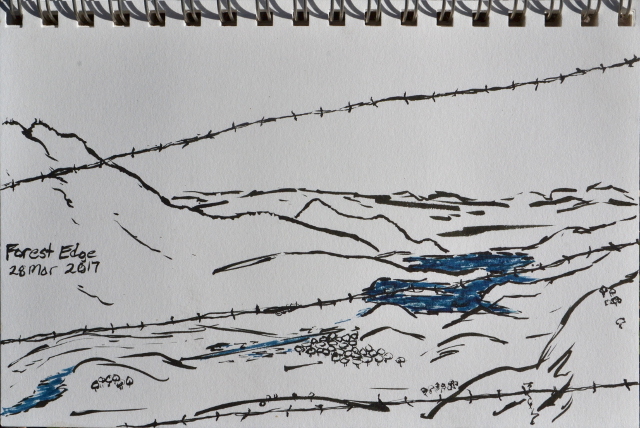 The crossings are very wide and the area quite flat so it is not flowing past quickly. Maybe that is a lot. Probably not? I have socks and shoes for hiking, but as I set off I am only in some minimalist trail runners I have used for river crossing in the past. 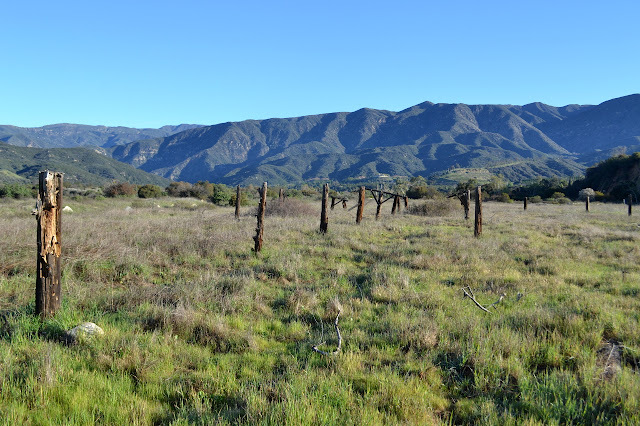 The far east end of the Santa Ynez Mountains and Kennedy Ridge back the flat of the Ventura River Preserve. These days, there are signs at every turn. I simply follow the ones pointing out Oso Ridge and work my way toward the river. This leads me past a long dead vineyard and scattered oaks among the green grasses. There is a thin creek, probably a diverging bit of the river, and then there is the thing itself. Ghosts from the past show what the flood plain was once used for. Off to another waterfall and with an even later start. The light is just better for this one in the early afternoon. Parking is even harder at Cold Spring than it was at San Ysidro and finding a spot means sloshing through the ford a couple times. And it is proper sloshing! There is some childhood recollection of this trail every time I start from the west side trailhead. It just looks right with its stencil letters cut through the metal sign. I always get the sense that this is the proper side to start although it quickly crosses over to the other trail starting on the east side of the creek. Cold Spring Trail starts here. Perfect pools along Cold Spring Creek. Also a bit of destruction from when the water rose higher. Today, the crossing is a big pool. It does not take very much walking downstream to find a good spot to rock hop across. The turn for the west fork is a little more obvious than usual. It seems like the area has been cleaned up of undergrowth even above where the high water flowed. The crossing here has had some stones set for hopping across and while a group coming the other way pauses to work up the courage to make a big hop on one set, I just detour a few feet downstream again to take an easier set of rocks. 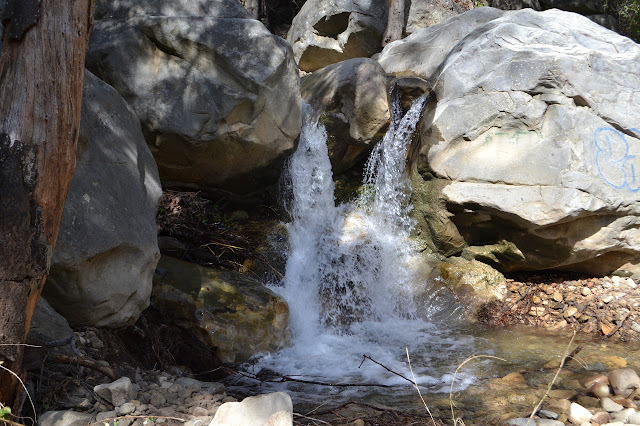 At just three feet, does it qualify as a waterfall? Such perfect water coming down the east fork!